The first catalogue of institutional records for the Royal Asiatic Society is now available on Archives Hub. These are for the Triennial Gold Medal which was awarded between 1897 and 1990. The idea of a Gold Medal was first suggested in 1887, but the matter was postponed until 1897, when a decision was made to institute a Gold Medal to commemorate the 60th Anniversary of the reign of Queen Victoria. Overseas Orientalists could already be honoured by the Society in the form of Honorary Membership, but at the time of its instigation, there was nothing to honour eminent British Orientalists. So for this purpose, a committee, formed under the direction of Mr (later Sir) A.N. 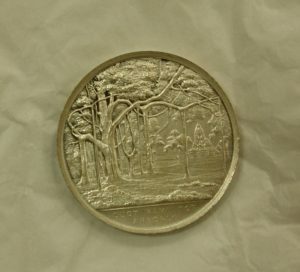 Wollaston, was established which chose a design for the medal based on the banyan tree. 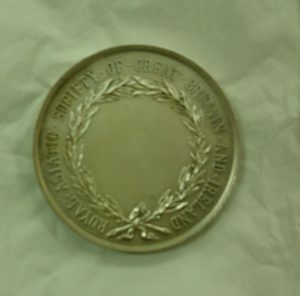 In 1898 the Society launched an appeal for funds to finance the cost of the new medal. By the end of 1899 nearly £300 had been subscribed. The first medal was presented on 25 May, 1898, by Lord Reay, President of the RAS, to Professor E.B. Cowell, an eminent Sanskrit scholar. 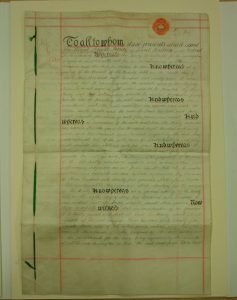 Declaration of Trust document which sets out the rules and regulations for the administration of both the finance and the conferment of the Medal, dates to 6th November 1900. The Gold Medal was presented at approximately three year intervals until 1990. The list of those to whom it has been awarded is a veritable who’s who of people who have dedicated their lives to Asian studies. Here are brief biographies of the earlier recipients. 1897 – Professor E.B. Cowell (1826-1903) – Edward Byles Cowell was born in Ipswich in 1826, and became interested in oriental languages at the age of 15, when he found copies of William Jones’ work in his local library. Self-taught he starting translating and publishing Sanskrit works. On the death of his father in 1842 he took over the family business, but continued to read voraciously. He married in 1845, and in 1850 entered Magdalen College, Oxford, where he studied for the next six years and catalogued Persian manuscripts for the Bodleian library. He resided in Calcutta from 1856 to 1867, as professor of English history at Presidency College, and from 1858 also as principal of Sanskrit College. In this year he discovered a manuscript of the quatrains (robāʿiyāt) of ʿOmar Ḵayyām in the Asiatic Society’s library and sent a copy to London for his friend and Persian student, Edward Fitzgerald. Having studied Hindustani, Bengali, and Sanskrit with native scholars, he returned to England to take up an appointment as the first professor of Sanskrit at Cambridge. He remained in Cambridge until his death in 1903. 1900 – Sir E.W. West (1824-1905) – Edward William West was born in 1824 and was educated at Kings College, London. He was a scholar of Zoroastrianism and translator of Pahlavi texts. He worked in India from 1844 for twenty years, as a civil engineer. In this time he became interested in the study of the Zoroastrian religion and undertook study to be able to understand its languages. He prepared five volumes of Pahlavi texts (the Marvels of Zoroastrianism) for Professor Max Müller’s Sacred Books of the East series, published from the years 1880 to 1897. He was made an Honorary Doctor of Philosophy by the University of Munchen. 1903 – Sir William Muir (1819-1905) – Muir was born in Glasgow in 1819. He attended Glasgow and Edinburgh Universities but before graduating his uncle secured a writership for Muir with the East India Company. He attended Haileybury before departing for India in 1837. Muir was stationed in the North West Provinces where he met and married his wife, Elizabeth, in 1840. By 1847 he was secretary to board of revenue of the North West Provinces based in Agra. In 1852 he became secretary to the Lt. Governor, James Thompson. He developed an interest in Islam Studies. He also learnt Persian and Arabic, and it was for this that he received the Gold Medal in 1903. In 1867 he was created a Knight Commander of the Star of India, and in 1868 he became lieutenant-governor of the North-West Provinces. Muir himself founded Muir Central College in 1873. In 1887, this became the University of Allahabad. Muir served from 1874 until 1876 as financial member of the Governor-General’s Council. He retired in 1876, when he became a member of the Council of India in London. In 1885 he was elected principal of Edinburgh University. In 1884, Muir was elected President of the Royal Asiatic Society, also serving as Vice-President from 1885-1886, and 1894-1897. His chief books are A Life of Mahomet and History of Islam to the Era of the Hegira; Annals of the Early Caliphate; The Caliphate: Its rise, decline and fall, an abridgment and continuation of the Annals, which brings the record down to the fall of the caliphate on the onset of the Mongols; The Koran: its Composition and Teaching; and The Mohammedan Controversy, a reprint of five essays published at intervals between 1885 and 1887. 1906 – Rev. G. U. Pope (1820-1908) – George Uglow Pope was born in Canada in 1820. He returned with this family to England in 1826 and trained as a missionary leaving for southern India in 1839. He was ordained in the Church of England in 1841. He left for England in 1849 but returned to Tanjore in 1851. He was much involved in education. He finally left India in 1881 and settled in Oxford where he made a mark as a lecturer in Tamil and Telugu (1884). He received an honorary MA in 1886 and the Gold Medal of the Royal Asiatic Society in 1906. He died in Oxford in 1908. 1909 – Sir G.A. Grierson (1851-1941) – George Abraham Grierson was born in 1851 in County Dublin. He was educated at Trinity College Dublin, as a mathematics student, but where he also first developed an interest for oriental languages. He studied Sanskrit and Hindustani before leaving for the Bombay Presidency in 1873. He was appointed Superintendent of the newly formed Linguistic Survey of India in 1898, which took 30 years to complete. Grierson was a prodigious author writing many publications on India and its languages. He died in Camberley, Surrey, in 1941. 1912 – J.F. Fleet (1847-1917) – John Faithfull Fleet was born in London in 1847. He joined the Indian civil service in 1865 and studied Sanskrit at University College, London, before joining the Bombay Presidency in 1867. He held many roles including Assistant Collector and then Magistrate, Educational Inspector, in the Southern Division (1872), Assistant Political Agent in Kolhapur and the Southern Maratha Country (1875), and Collector and Magistrate (1882). He began publishing articles about inscriptions in the mid-1860s. whilst continuing to study Sanskrit and Kannada. Fleet became the first epigraphist of the Government of India in 1883, and was subsequently appointed as the Collector and Magistrate of Sholapur in 1886. Fleet retired from India in 1897 and settled in Ealing where he continued his epigraphical studies. 1915 – Miss Agnes Smith Lewis (1843-1926) and her sister, Mrs Margaret Dunlop Gibson (1843-1920) – Agnes Smith Lewis and Margaret Dunlop Gibson were twin sisters born in 1843. Between them they knew more than a dozen languages. Agnes’s discovery of the Syriac Sinaiticus, on one of her many journeys to Sinai, was the most important manuscript find since that of the Codex Sinaiticus in 1859 and they made a significant contribution to Syriac and Arabic studies in their cataloguing of the Arabic and Syriac manuscripts at Saint Catherine’s Monastery. 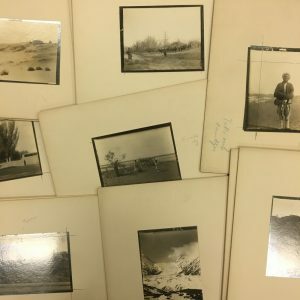 They travelled much in Europe and in the Middle East until the start of the First World War and they collected about 1700 manuscript fragments, now known as the Lewis-Gibson collection. Margaret died in 1920 and Agnes in 1926. 1918 – V.A. Smith (1848-1920) – Vincent Arthur Smith was born in Dublin in 1848. He passed the Indian Civil Services examinations in 1871 and was appointed to what would become the United Provinces in India. Between 1871–1900 he served in a variety of magisterial and executive positions including terms as district and sessions judge, eventually retiring as commissioner in July 1900. He published articles and books on the history of India, Indian numismatics and archaeology. By 1910 Smith was settled in Oxford where he joined St. John’s College and was appointed a Curator of the Indian Institute. He died in Oxford in 1920. 1922 –Professor H.A. Giles (1870-1935) – Herbert Allen Giles was born in 1845. he studied at Charterhouse before becoming a British diplomat to China, serving from 1867-1892. He modified a Mandarin Chinese romanisation system established by Thomas Wade, resulting in the widely known Wade–Giles Chinese romanisation system. On returning to England he was appointed the second professor of Chinese language at the University of Cambridge, succeeding Thomas Wade in 1897. He translated many Chinese works. Giles retired in 1932, and subsequently died in 1935. 1925 – Rev. A.H. Sayce (1869-1933) – Archibald Henry Sayce was born in Bristol in 1845. He was privately tutored before attending Queen’s College, Oxford, becoming a fellow in 1869. His interests were in Assyriology and he became a pioneer in its studies, publishing many articles and undertaking translations of cuneiform inscriptions. Sayce held a chair as Professor of Assyriology at the University of Oxford from 1891 to 1919. 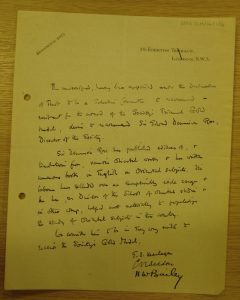 1928 – Professor D.S. Margoliouth (1858-1940) – David Samuel Margoliouth was born in London in 1858. He was educated at Winchester and Oxford where he graduated with a Double First and a significant number of prizes. He was appointed to the Laudian Chair in Arabic, Oxford University, in 1889, a position he held until he retired, from ill health, in 1937. He wrote many works on the history of Islam and translated and edited Arabic poetry. 1932 – Sir Aurel Stein (1862-1943) – Aurel Stein was born in Budapest in 1862. He studied at the Universities of Vienna, Leipzig and Tübingen, graduating in Sanskrit and Persian and receiving his Ph.D. from Tübingen in 1883. Stein came to England in 1884 to continue his studies and became a British citizen in 1904. Stein made four major expeditions to Central Asia to study its archaeology and published books about these expeditions. He brought back many artefacts to Britain. He died in Kabul in 1943 and is buried there. 1935 – Sir Denison Ross (1871-1940) – Edward Denison Ross was born in London in 1871. He was educated at Marlborough College and University College, London, before going to Paris and Strasbourg to study languages. In 1896 he was appointed Professor of Persian at University College London and remained there until 1901 when he took up an appointment as Principal of the Calcutta Madrasah Muslim College, the city’s chief educational centre for teaching Arabic and Persian. In 1911, this role was combined with that of Officer in Charge of the Records of the Government of India and Assistant Secretary in the Department of Education. In 1914 Dension Ross returned to the UK and became First Assistant at the British Museum, working in the Prints and Drawings Department cataloguing the Stein Collection. Denison Ross became the first Director of the School of Oriental Studies (later the School of Oriental and African Studies) in 1916, remaining as such until his retirement in 1938. He was a brilliant linguist having a working knowledge of over 40 languages. In another blog post we will explore who else received the Triennial Gold Medal. 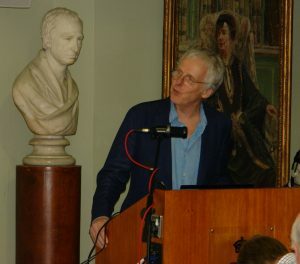 The Society no longer awards the Triennial Gold Medal – it has been replaced by the The Royal Asiatic Society Award which is conferred approximately every three years in recognition of outstanding contribution to scholarship in the field of Asian Studies. This week we were pleased to host two events at the Society, both of which involved people who have spent their professional lives involved in Asian studies. On Tuesday 17th April, the RAS hosted the launch of Professor Francis Robinson’s new book, Jamal Mian: The Life of Maulana Jamaluddin Abdul Wahab of Farangi Mahall, 1919–2012. 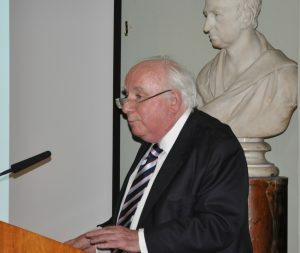 Professor Robinson, a former President of the Society, and a current Council member, has researched the colourful life of this dynamic personality, and he shared some of his insights with an interested audience. On Thursday 19th April John Falconer from the British Library lectured on “A Glorious Galaxy of Monuments: Photography and Archaeology in India in the 19th Century” in which he recounted the main exponents in the history of photography of architectural monuments in India, starting with early photography, taking over from, and working alongside artists in the documentation of material. The full lecture can be heard here. Our next event will be on Thursday 26th April, 6.30pm, when Dr Alex McKay (Sikkim Palace Archive Digitisation Project) will lecture on “The View from the Palace: The Sikkim Royal Archives”. W hope that many will be able to join us to learn about these interesting archives.